I am not a fancy cook. If something takes too many steps or too many ingredients that I don’t normally have on hand, I do not make that thing. I’m always looking for a way to make recipes simpler and faster. This “recipe”, if you can even call it that, is amazing. 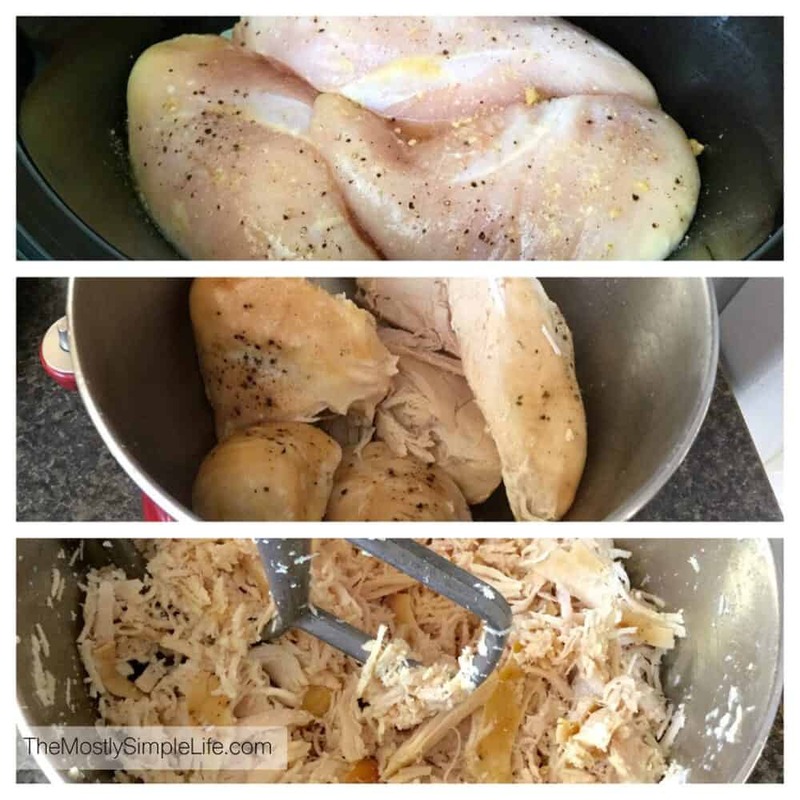 It makes delicious, tender chicken that you can use in any soup or casserole recipe you like. Plus, it’s so easy and so simple. It doesn’t get any better than that! Even better, you can make a large batch and freeze it. 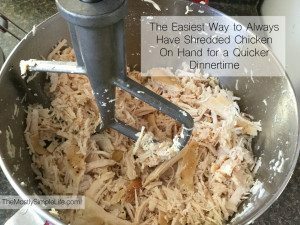 And dinnertime is faster because your chicken is already cooked and ready to go. I like to spray a bit of cooking spray inside my slow cooker. My slow cooker is similar to this one. Then place the chicken breast in so that it’s in a single layer on the bottom. Season it as you like. If I’m going to use the chicken for multiple recipes, I just use salt and pepper and a little chicken bullion powder to keep it simple. You can add a few tablespoons of water, but I’ve found that it’s not really necessary. Let the chicken cook on high for 3-4 hours, or on low for 7-8. I use my stand mixer (like this beauty), but I’ve heard of people using a hand mixer for this part. Just make sure the chicken is still warm or it’s too tough on your mixer. Turn the mixer up to a medium-high speed for just a few seconds and it will magically shred for you! Don’t let it go for too long or you’ll have chicken powder (ask me how I know). I hold a towel around the mixer for this part to avoid flying chicken chunks (ask me how I learned this one too). That’s it! I got about 10 cups of chicken out of this batch. I stored it in storage bags in 3-4 cup portions since that is usually how much I need for each recipe. Now making soup or a casserole has one less step since the chicken is ready to go. ⇒What tricks do you have to make dinnertime easier? I am enjoying your blog. What are you crafting these days? Thanks! I’ve got all kinds of sewing ideas from a book I got for Christmas. I need to settle on an idea and get all of the supplies to make it happen!